YAB team: Ground, Höweler + Yoon Architecture, LinOldhamOffice, Merge Architects, MOS, over, under, SsD, Studio Luz, UNI, Utile. 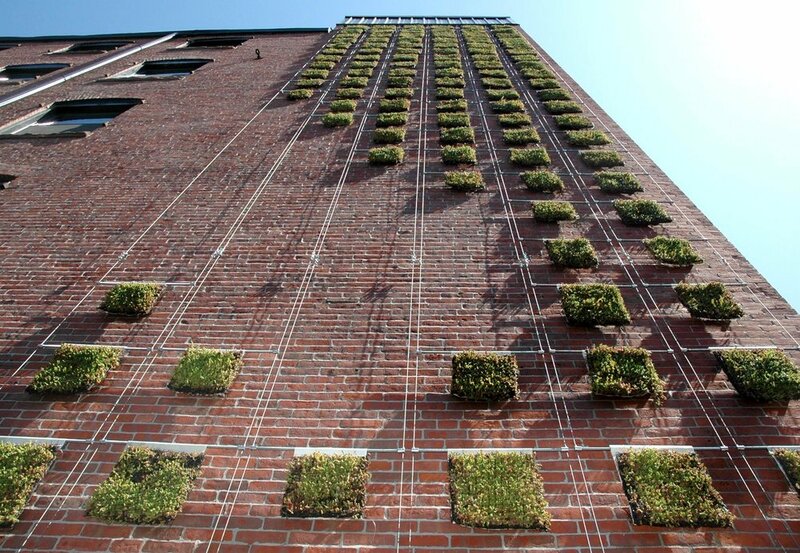 The outdoor installation is a prototype green wall, a suspended greenspace intended to generate awareness of underutilized sites in Boston and apply sustainable principles for creating healthy neighborhoods. The prototype illustrates how Boston’s scattered brick surfaces are opportunities for zero footprint public art that improves the city visually and environmentally. A metal cable system supports planted panels of varying dimensions, allowing the team to test the performance of the system for New England’s climate and for permanent installations in the future. The project is a collaborative work of ten emerging design firms created for the national AIA convention held in Boston 2008.